Moira and Connor O’Flaherty leave County Mayo for a better life in the Australian goldfields. But all they find in the harsh soil of Ballarat is poverty and heartbreak. As the Eureka flag is raised, Moira makes a terrible pact in order to save her family. The effects of this one night will be felt for generations. Spanning one hundred and fifty years of toil, hardship, and devastating etcetera, The Sovereign Wife is one woman's epic journey across our sunburnt country – from country Victoria all the way to the Simpson Desert. Taking inspiration from The Man From Snowy River, Baz Luhrmann's Australia, and the spellbinding artwork of Ken Done, it is a wild bush-doof through our national identity. 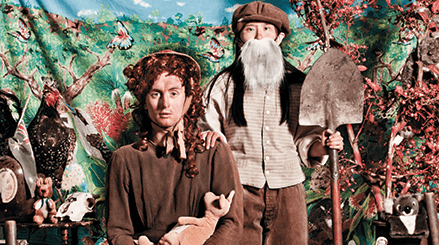 After vivisecting the Civil-War melodrama (Summertime in the Garden of Eden) and Evil-Child horror films (Little Mercy), DIY drag–theatre troupe SISTERS GRIMM are set to tackle their biggest challenge yet: the Great Australian Frontier Epic.